Thanks for your interest in volunteering with Share Our Spare! Volunteers play a critical role at our Sharehouse helping us sort and inventory donations, package diapers and make clothing bundles. 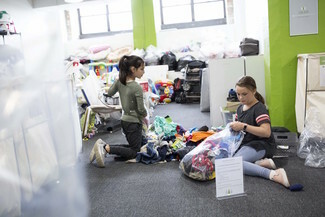 Anyone age 6 and up is welcome to volunteer at the Sharehouse. All children under the age of 18 must be accompanied by an adult. The entrance to the Sharehouse is on Sangamon and the sign out front says “Chestnut Lofts.” Just call Share Our Spare on the directory to be buzzed in. Street parking is available but can be limited on weekdays. There are usually metered spots available on Ogden or Chicago. We are also close to several public transportation options, including the Chicago Blue Line stop and the 66 Chicago Bus. We ask all our volunteers to consider bringing some of our most needed items to your volunteer shift. Currently we are really low on size 4, 5 and 6 diapers and wipes. Additionally, please feel free to bring any extras with you that can be passed along to those in need. Click here for our full list of the items we accept. If you have any questions or concerns, please email [email protected]. (Sat. 1:00pm - 2:30pm) 935 W Chestnut St.
(Sat. 10:30am - 12:00pm) 935 W Chestnut St.